What Happens When It’s Your Kids in One? My daughter Tory had been bugging her brother Max to drive her to the Jersey Shore since their shore “date” with their Uncle Michael Michael had been cancelled due to rain. Trying to be a helpful Mom I dragged Max out of bed this morning and Tory quickly followed. After a lot of growling around on Max’s part they loaded up the old Ford Explorer and took off for the shore. I stayed home to accomplish a “to do” list and give them some time together before Max returns to college. One of my worst fears now real, I asked for details. Mike told me what he knews, clearly and without drama, bless him. I hung up and called Tory’s cell phone. She answered, sobbing out some details about the accident, but more important, their approximate location on the Garden State Parkway. Somehow a photo just doesn't convey how it looks in person. I took off for my Honda Pilot at a run, jumped in, took a huge deep breath and fired up the engine. The accident was barely 2 miles from where the kids got on the Parkway. They went almost all the way through a construction zone, Max changed into the fast lane readying for an Easy Pass toll lane and traffic stopped dead in front of him. He said he braked, but didn’t have enough time to come to a complete stop. He hit the woman in front of him. Does the crunched side view help convey the wreckage better? By the time I got to the scene of the accident, Max and the woman had exchanged pertinent information. She, a mom herself with a son the same age, reassured me that she and her passengers weren’t hurt, that traffic was ridiculous. I, relieved to see my two kids and the passengers of the other vehicle unhurt, almost missed the drama ensuing behind our old Explorer. Apparently another two vehicles had crashed in exactly the same way, for exactly the same reasons; however, the four male occupants were definitely not as calm, polite and cooperative as Max and the Other Mom. One of NJ's finest was very kind and helpful today. 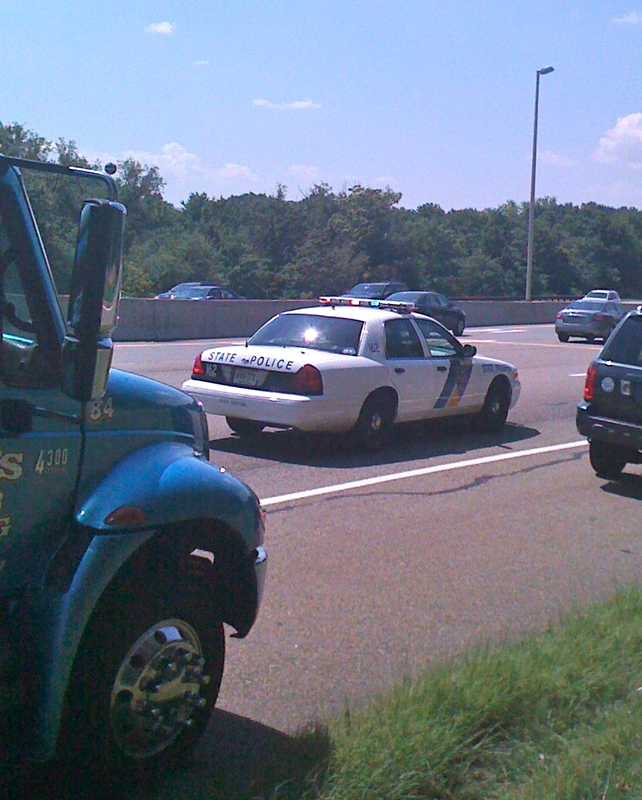 A State Trooper pulled up, then another. The trooper who handled Max’s accident was polite, kind and helpful. He filled out the paperwork and called for a tow truck since transmission fluid and other fluids were leaking out of the truck and into the roadway, clearly signaling that the Explorer was driving itself absolutely nowhere. 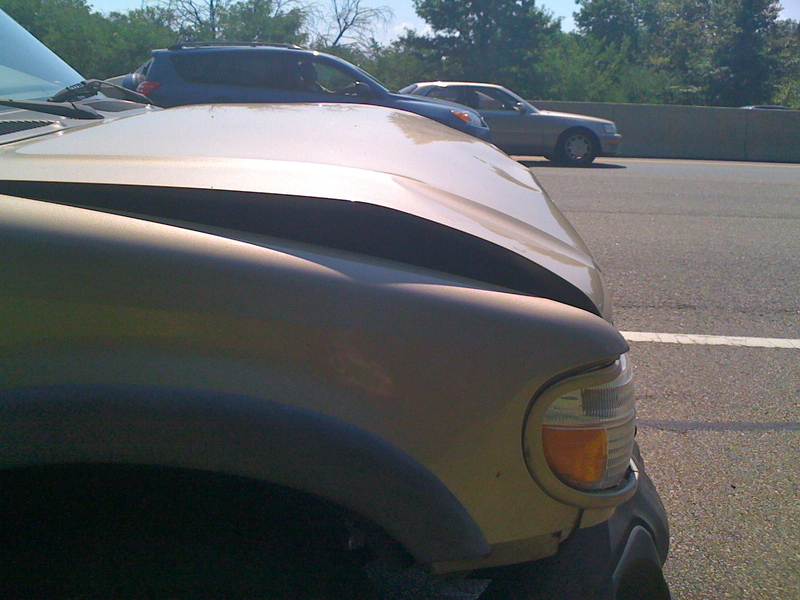 With his okay, I worked the phone and called our local auto body repair shop, Bloomfield Auto Body, letting them know the Explorer would be arriving on a flatbed. 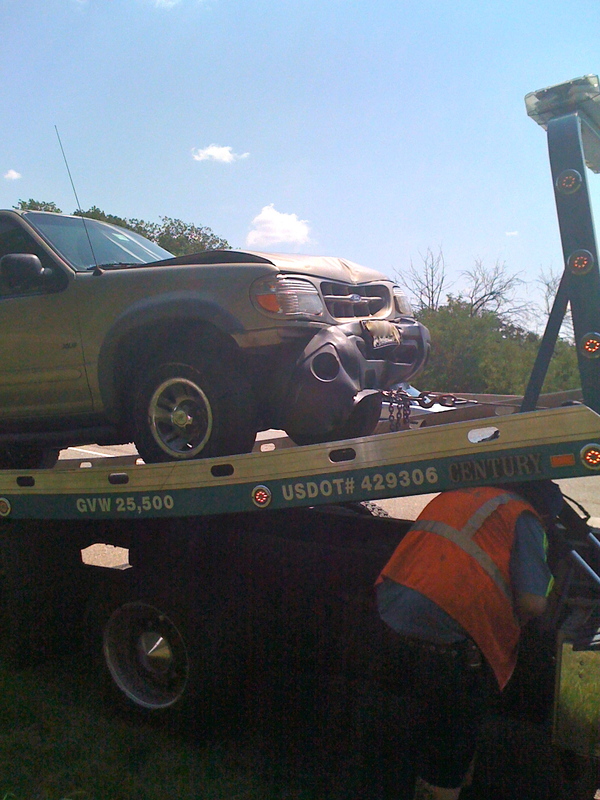 Our second vehicle being loaded onto a flat bed tow truck in less than two years. Max has contacted our insurance company. Neither he nor Tory is complaining of aches or pains. 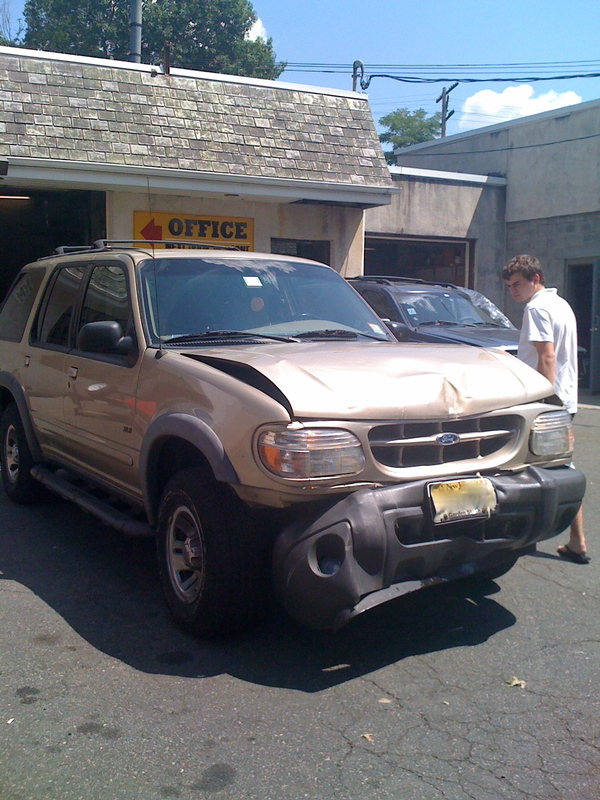 My husband Mike has been apprised of the condition of his Explorer via emailed photos. 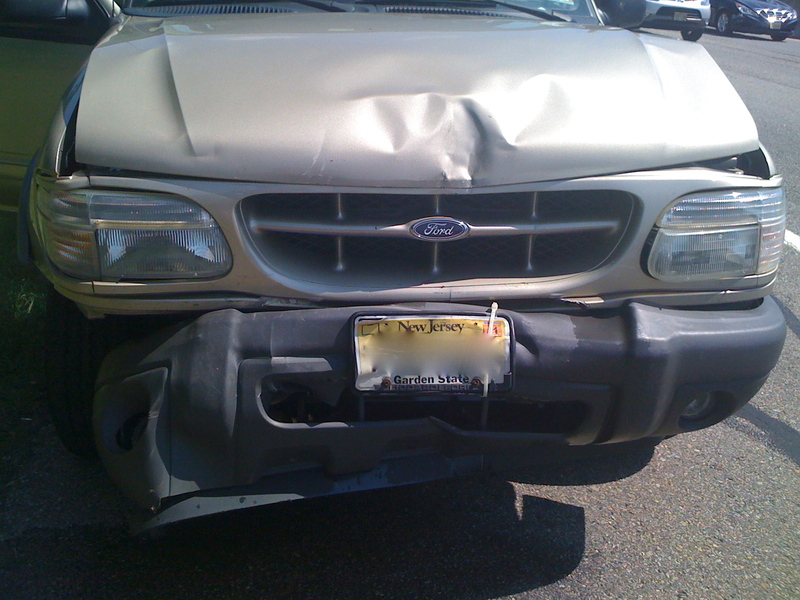 After speaking with Anthony at Bloomfield Auto, we’re pretty sure our family is now officially down a vehicle. Max has lost his wheels. But my children are safe. Does it look totaled to you?